Created by Alexander Wright (The Flanagan Collective) and Phil Grainger (Gobbledigook), ORPHEUS is an internationally award winning show wound together from hair-raising spoken word and soaring soul music. It’s a modern retelling of the ancient myth, transporting us through dive bars, back streets and late night karaoke. It’s a show about falling in love, about seismic shifts in your everyday life, and about how far we’d want to go to save those we hold so near and dear. It’s a 5,000 year old story, but told for us, here, now. Performed by a storyteller and a musician, the tale is wound together from a guitar and a book, and the audience. Told through a fusion of hair raising spoken word and original, live, soulful music, ORPHEUS sits in between spoken word poetry, an acoustic gig and a theatre show. We created ORPHEUS to play anywhere and everywhere. The show premiered in the garden of a Dutch cheese shop in Cromarty. Since then it’s played in houses, pubs, halls, shops, tunnels, libraries, foyers, bars, empty lofts and – very occasionally – a theatre. 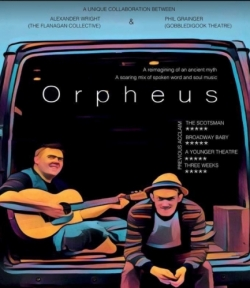 ORPHEUS won Best Theatre (weekly) award at the Adelaide Fringe and the Summerhall Award at VAULT Festival. This is a Cheshire Rural Touring Arts production. Ticket price £10 includes a Mini Mezze of Greek Treats! Cabaret-style seating. Why not book a table of 5 or 6 with friends or family, or enjoy making new friends at your table? Note: Tables are allocated in order of booking.